Gold prices are currently in a pullback, but it is nothing that hasn’t been seen before. The World Gold Council (WGC) pointed out in a report from January 2014 that since the 1970s, gold has had 12 corrections of more than 20%, adding that “After each of those corrections, an interesting pattern has emerged.” Past performance is not a guarantee of future results, but it is still worth examining in order to see gold’s behavior under various historical conditions. As of yet, the gold price has always recovered quite well from a pullback, which should be reassuring to many gold investors right now. 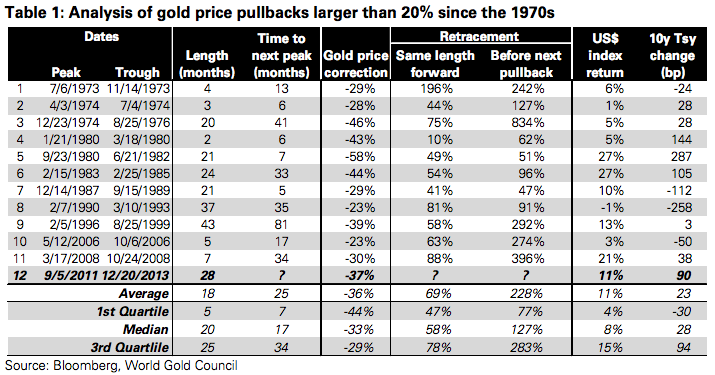 Below we outline WGC’s analysis of historical gold price pullbacks. During the time frame analyzed above, the gold price fell on average by 36% over 18 months, and there were a few instances where a pullback lasted more than two and a half years. Corporate bonds: Those who buy corporate bonds that end up defaulting typically recover no more than 50% to 70% of their face value. Sovereign debt bonds: Tend to recover 60% or less of their value. Interested in diversifying your portfolio out of stocks and bonds? A self-directed Gold IRA allows you to add physical gold coins and bars to your retirement account, in addition to traditional paper-based assets. American Bullion specializes in converting your existing IRA, old 401(k), or other qualified retirement plan to a Gold IRA, tax-free and hassle-free. 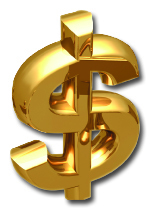 Gold offers tangible protection for your investments and can act as a hedge against inflation and economic uncertainty. For more information, call us today at 1-800-326-9598 to speak with a dedicated agent.